History and myth come together in the figure of Alexander, son of Philip II, born in Pella in 326 BC. None other than Aristotle, born in Stagira, educated Alexander, before he was proclaimed King of Macedonia at the age of 20 and thence went on to conquer and expand the then known world. Many sites in Northern Greece still remain inextricably associated to the presence of the legendary strategist, whose life inspired numerous works of art. 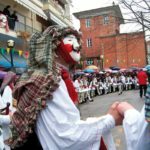 BOREAS Art & Nature Travel Services has carefully planned dedicated cultural tours through historic places, archaeological sites and museums to tell the unique story of Alexander of Macedonia. 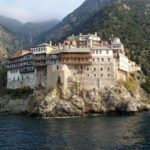 Northern Greece, unknown yet impressive and rich in history and tradition emerges during the ‘Land od Alexander the Great’ tour that crosses the most important places of the ancient kingdom of Macedonia. From Thessaloniki, the modern capital of the region of Macedonia and lively university city, along the axis of the ancient Egnatian Way we reach the ancient capitals of Upper Macedonia Elimeia and Orestis and then head towards the great ancient capitals, Aigai (nowadays Vergina) and Pella. Here, we will seek traces of Alexander’s passage and we will admire the magnificent royal tombs, which are conserved in excellent condition. Dion, the sacred city of Zeus and important political center at the foothills of Mount Olympus, the mythical home of the gods of antiquity evokes the beliefs and rituals of worship. 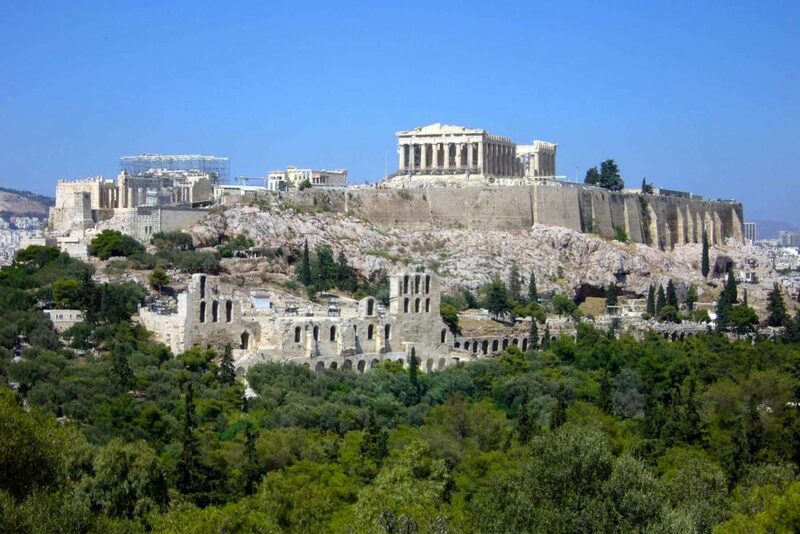 Amfipolis and Filippi, city founded by Philip II to control the rich goldfields of nearby Mount Pangaion, on the other hand, impress by the splendor and quality of the monuments and the findings. We certainly do not omit a visit to the ruins of the small town of Stagira, the birthplace of the philosopher Aristotle, teacher of Alexander the Great, while the trip concludes with an experience not to be missed: the circumnavigation of the monastic state of Mount Athos to admire the impressive monasteries, in unique architectural style that look like castles. The ‘Land of Alexander the Great’ is an archaeological tour, that may involve walking on rocky archaeological sites, under the sun. Upon arrival at Thessaloniki (Salonica) the capital of the modern region of Macedonian, we are visiting the city, founded in 315 BC by King Kasander of Macedonia, brother-in-law of Alexander the Great. The city has known such glory in the Roman period, being under the tetrarchy of Diocletian, one of the four capitals of the Roman empire. 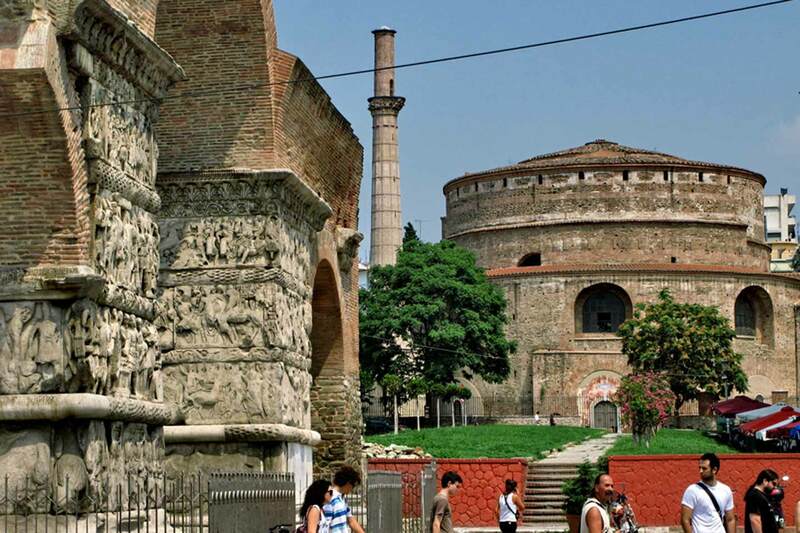 Second capital of the Byzantine and Ottoman empires, Thessaloniki has been a city of great importance also for the Jews. Among our visits, the important archaeological museum of the city, the Rotunda, roman governor Galerius’ Arch and his Palace. Continue visiting the churches of Hagia Sophia and Acheiropoiitos, Byzantine monuments protected by the UNESCO, and the Roman Forum. Transfer to hotel, dinner and overnight stay in Thessaloniki. From Thessaloniki, following the Egnatian Way, a modern highway following the ancient Roman road, we are headed towards the mountains of Western Macedonia, birthplace of the first kingdoms of Upper Macedonia. 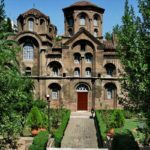 Once in Aiani, we will visit the interesting museum of Elimia and passing by the ancient region of Orestis, we will reach the picturesque town of Kastoria, dotted with splendid byzantine churches. Dinner and overnight stay in Kastoria. The Macedonian kings, once dominated the region of Upper Macedonia, wanted to conquer the fertile plains of Lower Macedonia for more political, economic and commercial power. Thus, the great capitals of the time of Philip II and Alexander the Great were born, without which the expedition of the Macedonian strategist in Asia would not be possible. First visit of our day is Aigai (nowadays called Vergina), the first capital of the Macedonian kingdom. 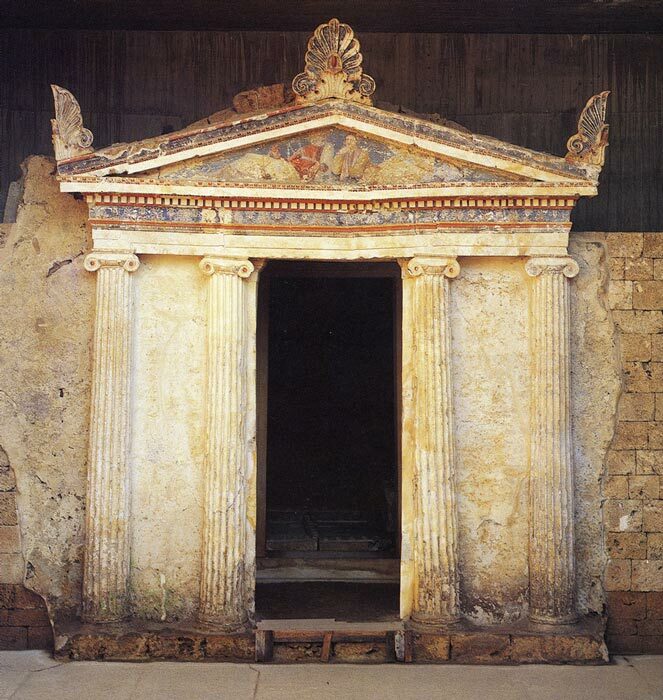 In the museum of the Great Tumulus, tomb of king Philip II we will remain astonished by the quality and the wealth of the findings. From Vergina, along the way to Pella we will stop briefly to visit Aristotle’s school in ancient Mieza, where Alexander himself followed the philosopher’s teachings. Pella, the great capital of the kingdom by the times of Philipp II and Alexander the Great, with an impressive archaeological site and a new, interesting and well-arranged museum will be the last visit of the day before returning to Thessaloniki. Accommodation in the hotel, dinner and overnight stay in Thessaloniki. The sacred city of Dion, at the foothills of Mount Olympus, mythical residence of the ancient gods, has not just been an important center of worship, but also an important political center. Based on religious faith, the Macedonians could not only prove their equality to the rest of the Greeks, but perhaps their superiority. In fact, Dion was a city of pilgrimage, celebrations and games. 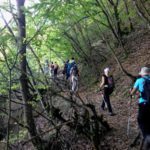 From Dion, we proceed to Ambelakia, picturesque village on the Tempi Valley: here, we can enjoy lunch while admiring a majestic panorama of Mount Olympus in front of us. Return to Thessaloniki, time at leisure and overnight stay. 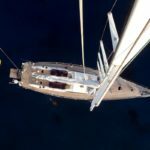 The northern coast of the Aegean Sea was the ‘Wild West’ to the ancient Greeks: a rich, but difficult region to conquer! King Philip II managed to strengthen his kingdom by conquering Amfipolis and Filippi, important mining and commercial centers, at the foothills of Mount Pangeon. From Thessaloniki, we are headed towards Amfipolis to the East: much has been recently discussed about the rich Parian colony, where a richly decorated burial tumulus was discovered. We visit the famous Lion of Amfipolis and the local archaeological museum, before heading for Filippi, named after king Philip II himself, where the Macedonians could exploit the rich goldfields of nearby Mount Pangaion. Filippi, recognized as heritage of mankind by the UNESCO, is also famous for the battle between Marcus Aurelius and Octavian on one side, and Brutus and Cassius on the other, that change the route of Roman history. Filippi was also the first place in Europe, where Saint Paul arrived in 50 a.D. during His second missionary journey. In the afternoon, we arrive in the picturesque town of Kavala. Accommodation in the hotel, time at leisure, dinner and overnight stay in Kavala. 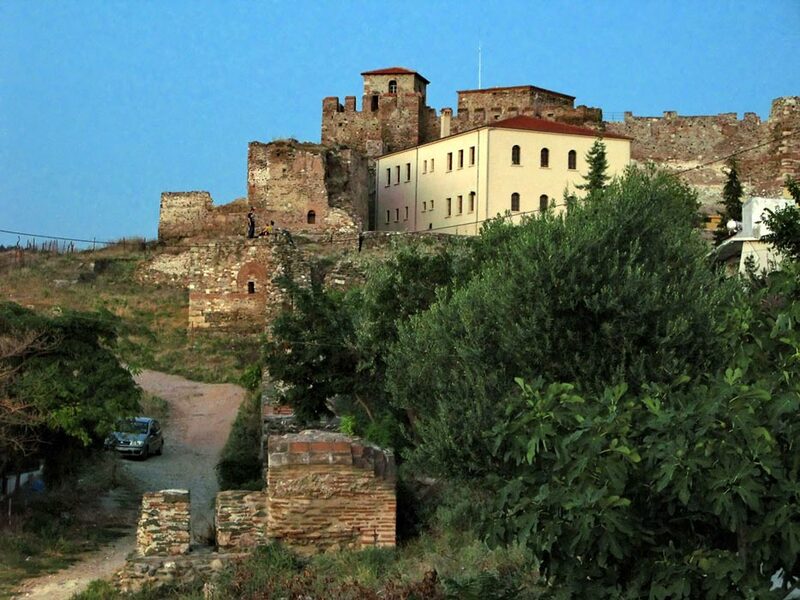 The Chalkidiki region, in ancient times was an alliance of city-states rich by trade and mining. Here, in the small town of Stagira was born Aristotle, one of the fathers of philosophy. 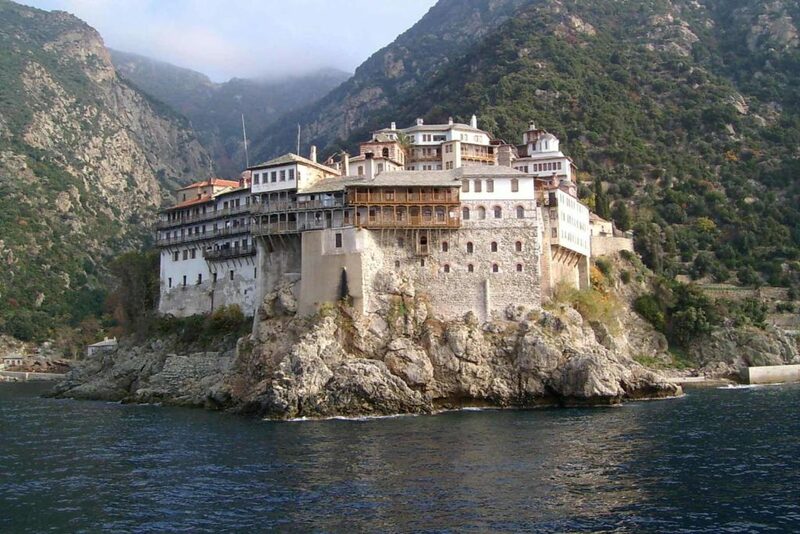 After briefly visiting the small archaeological site of Stagira, we proceed to Ouranoupolis, where we embark on a cruise to admire the impressive byzantine monasteries of the independent monastic state of Mount Athos. Upon return in Ouranoupolis, lunch and departure towards Thessaloniki along the emerald coast. Upon arrival at Thessaloniki, transfer to the hotel, accommodation, time at leisure and overnight stay in Thessaloniki. Before transfer to the airport for the flight of return, we visit the great church of San Demetrius, patron Saint of Thessaloniki. We visit the picturesque Upper Town, from where we can admire a stunning panorama over the entire city and the walls built by emperor Theodosius. Departure to the airport of Thessaloniki.